Honolulu, Hawaii — St. Francis Healthcare System of Hawaii presented Vincent H.S. 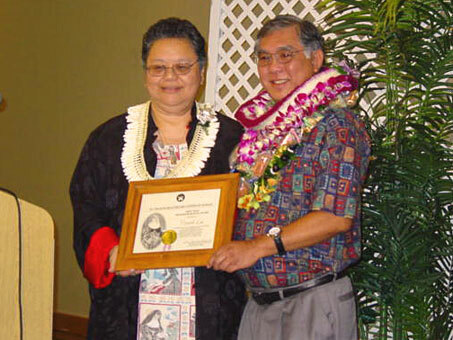 Lee, chief executive officer, Hawaii Health Systems Corporation, Oahu region, with the 2007 Mother Marianne Community Award during a luncheon ceremony on January 23, at the Ala Moana Hotel. Mr. Lee was recognized for his oversight of the growth of many of the community health programs, which remain hallmarks of St. Francis today, including Home Care, Health Services for Senior Citizens, and Mobile Care Health Project. Leahi Hospital is one of 12 facilities operated and managed by the Hawaii Health Systems Corporation (HHSC). Established in 1996, HHSC is a public benefit corporation of the State of Hawaii. As the state’s safety-net healthcare system, HHSC continues to fulfill the state’s promise to provide quality, hometown healthcare.